While Massive Open Online Courses (MOOCs) offer a complete course experience free of charge by definition, there are monetary cost and benefit associated with it. Several stakeholders are associated with the creation and the distribution of MOOCs as well as research and further services beyond the course itself. The diversity of MOOCs and their players makes it thus difficult to analyse a universal business model for MOOCs. Also, the growing influence of MOOCs attracts new stakeholders in the market, bringing in new services, sponsorships, customers, cross-financing models etc. This paper focuses on monetary costs as well as direct and indirect revenues of MOOCs and their associated services, and offers further readings for related issues. 2. Introduction – Why do business models for MOOCs matter? Massive Open Online Courses (MOOCs) are complete courses offered for free online. The participants do not have to pay for a full course experience: all the resources and most of the course services (e.g. feedback, tests, quizzes, exam and some limited tutoring). But who is paying for the efforts in developing MOOCs and for all the operational costs? To answer that question we need to look at possible business models describing the conceptual structure that supports the viability of a business (i.e. how an organisation fulfils its purpose including all business processes and policies). Business models can apply to any type of organisation including one at the governmental level (see for example chapter 8 of UNESCO-CO, 2016). Currently, one of the main challenges in the area of MOOCs is to develop sustainable business models. However, creating and analysing a general or ‘universal’ business model for MOOCs is difficult, if yet impossible. This is mainly due to the fact that several stakeholders are involved in the creation and the distribution of a course, as well as research and further services beyond the MOOC itself. The content of a course might come from a university, a company, a non-profit organisation or other parties. When it comes to the distribution, there are platforms that use content from external partners and generate revenue from issuing certification or additional services. Other platforms are either part of a higher education institution that provides the content or funded by a third party. Thus, the conceptual differences of these various content providers, platforms and other stakeholders make it difficult to establish a universal MOOC-model. 3.1. What are business models? The ‘business model’ concept is a theoretical model being used in science and the business-context. Especially, the use of word ‘business’ appears to be confusing: although the concept was developed in the context of for-profit businesses, it is now applied to any type of organisation, including for-profit, non-profit,governmental or any other type of organisation. In addition, there are many versions of business models. Al-Debei (2008) identified four primary dimensions while Yoram (2014) comprised the following three components: (1) Customer Value Proposition; (2) Infrastructure (both resources and processes) and (3) Financial Aspects. However, the economic models cannot be applied to open licence and free resources like Open Educational Resources (OERs) and some parts of MOOCs (Stancey, 2015). Stancey’s argues that the classic economy is based on scarcity while OERs and MOOCs are based on abundance at no cost. Thus, complete different approaches might be needed. With the aim to either develop a new one or document existing business models, many frameworks and templates are used. The most popular one used nowadays is the Business Model Canvas. 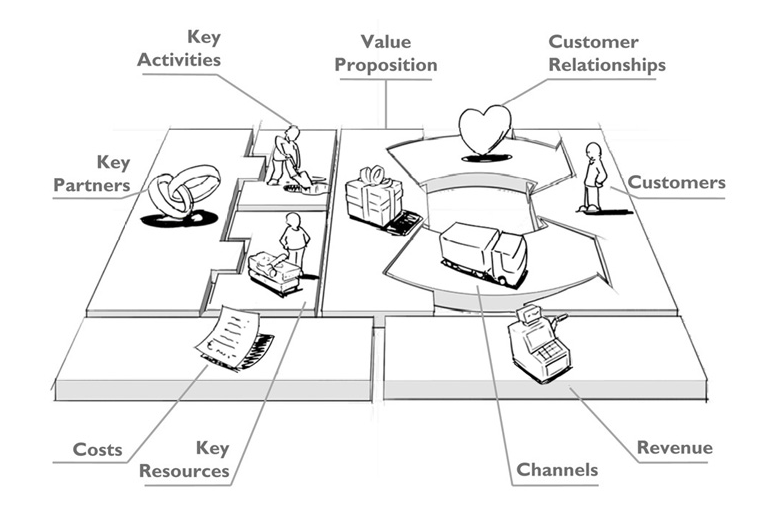 The Business Model Canvas was initially proposed by Osterwalder (2010) based on his earlier work on Business Model Ontology (Osterwalder, 2004). Since then, new canvases for specific niche markets have appeared, such as the Lean Canvas (https://leanstack.com/lean-canvas/) and Open Business Model Canvas (http://edtechfrontier.com/2015/12/08/converging-forces/). In addition, the latter includes ‘Social Good’ and ‘CC licence’ (https://docs.google.com/drawings/d/1QOIDa2qak7wZSSOa4Wv6qVMO77IwkKHN7CYyq0wHivs/edit) while the Lean Canvas is especially in the interests of the start-ups (https://canvanizer.com/how-to-use/business-model-canvas-vs-lean-canvas). Value Propositions: A promise of value to be delivered and acknowledged and a belief of the customer that value will be delivered and experienced. A value proposition can apply to an entire organisation, parts thereof, customer accounts, or products or services. Customer Segments: What group(s) of customers is/are a company targeting with its product or service by applying filters such as age, gender, interests and spending habits. Channels: What channels does a company use to acquire, retain and continuously develop its customers. Customer Relationships: How does a company plan to build relationships with the customers it is serving. Revenue Streams: How is a company pulling all of the above elements together to create multiple revenue streams and generate continuous cash flow. Listed below are the components that altogether form the cost structure of a business as shown on the left side of the canvas (Figure 1). Key Resources: The resources that are necessary to create value for the customers. These resources could be human, financial, physical and intellectual. Key Partnerships: What strategic and cooperative partnerships does a company form to increase the scalability and efficiency of its business. Costs: What are the costs associated with each of the above elements and which components can be leveraged to reduce cost (http://www.infocomm.org/cps/rde/xchg/infocomm/hs.xsl/39894.htm). 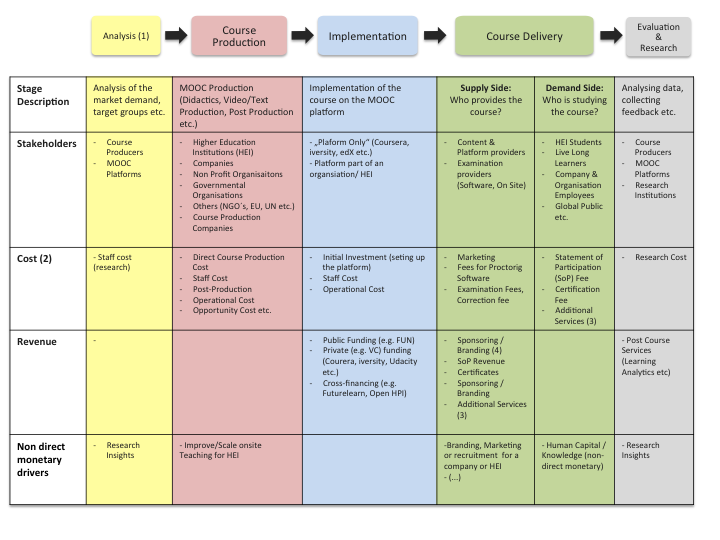 As mentioned above, applying the Business Model Canvas (BMC) to MOOCs is not straightforward due to the high variability in concepts and the diversity of stakeholders involved in a course. The recent UNESCO-COL (2016) publication clearly demonstrates this and only gives some examples of BMC at governmental level. Since it is quite common that more than one business or organisation creates and distributes a MOOC, this paper suggests to just analyse the sub-goals of each stakeholder (e.g. the value proposition, customer relationship, key activities, partnerships and resources as well as the costs and revenues might be very different for each stakeholder). A possible common value proposition for all stakeholders could be, that a MOOC’s content brings additional knowledge and learnings to the participants. Considering the high variation of the different stakeholders with regard to the components of the BMC, this paper proposes a new model to analyse drivers behind the MOOC business with focuses on costs and revenues. This table only covers the main stakeholders, and their associated costs and revenues. The costs and revenues in each row reflect a stakeholder’s expected return and expenditure for that specific stage (Example: An NGO produces an online course in collaboration with a University and delivers this on an external MOOC platform. There are production cost for the NGO & the University as well as implementation cost for the MOOC platform. The MOOC content is free for learners, however the revenue from a Statement of Participation (SoP) and certificate sales are shared between all three parties. ), company or organisation that provides the content and usually focus on the distribution of content (e.g. edX, coursera, iversity).). Thus, in theory, one could set up an individual business model for each stakeholder. The cost/revenue structure of a content provider and an external MOOC platform could possibly be the main differentiation. While the content provider generates its cost mostly from course production and course delivery, an (external) MOOC platform (Meaning platforms that are not part of the HEI (Higher Education Institution), company or organisation that provides the content and usually focus on the distribution of content (e.g. edX, coursera, iversity).) not only spends most of its money on course implementation, distribution and but also has higher (operational) fix cost, resulting from hosting and improving the platform. It is the usual case that the content/course providers (e.g., a university) receive funding or revenues from other sources other than their MOOCs activities and cross-finance their MOOCs platform. Therefore, their primary goal might not be making a profit with their MOOC programme but offering it for the needs of marketing, branding, recruiting etc. Overall, it might be worth noting, that not only the absolute number of MOOCs is growing (A closer look at the growth of existing courses between 2011-2016 can be obtained by accessing the following link https://www.edsurge.com/news/2015-12-28-moocs-in-2015-breaking-down-the-numbers), but also an increasing number of new stakeholders are entering that market, resulting in the emergence of new cooperations, new services, sponsorships, customers, and cross-financing models, etc. in MOOCs. 5.1. What are the general costs to produce a MOOC? The production of further cost-intensive resources, such as graphs, animations, overlays etc. The development costs for MOOCs are thus difficult to estimate The numbers vary between $40.000 – $325.000 for each course, taking all costs into consideration (Hollands and Tirthali, 2014). Without taking staff cost and initial investment (studio etc.) cost into consideration, these numbers might be lower at times. In addition, about $10.000-$50.000 are needed as operational cost for teachers, assistants and mentors, for every course running on a MOOC platform. Video production is often one of the major cost drivers. A report estimates a high quality video production cost of $4,300 per hour of finished video (http://cbcse.org/wordpress/wp-content/uploads/2014/05/MOOCs_Expectations_and_Reality.pdf). Additional costs are needed for the MOOC platform, a fee (annual or per MOOC) for a partnership with a MOOC provider, marketing, etc. providing MOOC on an institution’s own platform and not outsource it to one of the MOOC platforms. low-cost partnership for services that are scalable and at best to organise cross-institutionally. But essentially MOOCs offer a complete course experience to learners for free. Since direct revenues from MOOC courses are often less than the cost to produce and host the courses, the costs are not (directly) paid by MOOCs participants but by other parties. A 200-page report by the Center for Benefit-Cost Studies of Education from the Columbia University. It focuses on reasons of how and why institutions engage in MOOCs. The six major goals (Extending Reach and Access, Building and Maintaining the Brand, Improving Economics, Improving Educational Outcomes, Innovation in Teaching and Learning, Research on Teaching and Learning) are discussed in theory and on the basis of 13 cases. A research paper by authors from TU Dresden, TU Graz and Uni Graz that analyses different business models for MOOC platforms and presents a cost model of the Austrian iMooX platform. Note that these services can be either executed by the content provider, the distribution party (platform) separately or together. According to many U.S. and European studies, the most dominant objective for educational institutions to be involved in MOOCs is to increase their institution’s visibility and to develop better reputation. In addition, institutions in these continents indicate that using MOOCs as an innovation area (e.g. improve quality of on-campus offering, contribute to the transition to more flexible and online education, improve teaching) and responding to the demands of learners and societies are important objectives as well. Consequently, the possible revenue streams are related to these objectives as well. There are not many empirical data on detailed costs, funding and revenue structures of MOOC platforms. The distribution of a fully produced Online Course has almost zero marginal cost, rather, services such as the platform development, course integration, analysis, branding etc. account for the largest part of the total cost. The big MOOC platforms are usually either publicly funded (e.g. FUN) or financed by a model that is leveraged with equity capital and/or venture capital (e.g. Coursera, iversity). Private (e.g. companies) or public investors (e.g. foundations) supported various providers through substantial investments (partially in the double-digit million euro range) in that stage. It can be assumed that these investments were mainly used for the establishment of technical infrastructure, business cooperation and market position. Hence, the platform providers must generate turnover with increasing establishment on the market in order to pay returns to the investors. But how do MOOC providers achieve turnover? Typically, the revenues are shared with the content provider in a pre-defined revenue share. Recruiting Services for companies and other organisations (E.g. Coursera charged companies a flat fee for introductions to matched students. The revenue would be shared with the HEI whose courses the student had registered for. At launch, positions were limited to Software Engineering and initial companies using the service included Facebook, Twitter, AppDirect, and TrialPay). Further services for the professional development process of an organisation (customer relationship management, webinars, course moderation) etc. Most elements in this business-to-business (B2B) model are related to the MOOC platform providing paid services to mainly higher educational institutions or corporates. Corporate training is getting increasingly relevant, as more organisations use MOOCs for their professional development activities. This model focuses on the training or human resources development needs of corporates. In other words, MOOC providers charge corporations by the number of employees participating in courses or further services they may need. This model also targets the participants who would like to improve their skills. Corporates often foster the use of MOOCs for professional development activities due to their higher flexibility and lower cost structure compared to onsite training. 6.1. Will MOOCs be for free? As an increasing amount of stakeholders gets involved in the creation of MOOCs, there might be a trend of greater diversification of the services around and beyond the MOOC itself. The percentage of organisations (companies, and public) who use MOOCs as part of their professional development training will probably be increasing. Whether these courses will remain free of charge for this purpose is unclear though. Depending on the target groups (students, lifelong learners, employees etc. ), there might be price discrimination or product differentiation with additional services for MOOCs. Universities typically offer a bundle package including a range of services such as teaching, assessment, accreditation and student facilities to all learners, whether they require them or not. MOOCs are opening up a discussion around the unbundling of such services. Unbundling means that parts of the process of education are not provided by one, but several providers, or that some parts are outsourced to specialised institutions and providers. Regular examples are support of the study choice process, study advice and tutoring, content creation and development, examination training, assessment and proctoring, learning platforms, learning analytics services, etc. As such, different educational services are split amongst different funding schemes and even different customer segments. Some (educational) services are outsourced to third parties for concerns such as cost efficiency or organisational priorities. As such, different educational services are unbundled. Freemium business models depend on the money that is generated from additional services to be paid for next to the basic product – service offered for free. MOOCs are seen as an accelerator of these unbundling processes by outsourcing the marketing efforts, ICT/delivery platform, exams, learning analytics services, etc. Consequently, the business model of MOOCs (and education) will change as well. Despite the fact that Massive Open Online Courses (MOOCs) are offering a complete course free of charge by definition, there are monetary costs and benefits associated with it. Several stakeholders are associated with the creation and the distribution of MOOCs as well as research and further services beyond the course itself. The diversity of MOOCs and players behind it makes it thus difficult to apply a universal business model to MOOCs. Currently, a successful and financially sustainable business model of MOOC has yet to be developed. Since MOOCs are free of charge, services around MOOCs and additional values (e.g. certification) are offered in order to create revenue. The whole cost-revenue cycle is even more complex since most content providers cross-finance their spendings and many MOOC platforms receive external funding for their activities. The rapid growth in the MOOC market leads to the influx of new stakeholders, bringing in new services, sponsorships, customers, cross-financing models etc. in the whole world of MOOCs. Currently, there is also a trend towards an increasing amount of corporations using MOOCs or the format of MOOCs for professional development activities, which might not only increase the revenues and business opportunities in the market substantially, but also challenge the open education approach. However, some MOOC platforms (e.g., FUN) tries to tackle this by providing SPOCs based on MOOCs. Al-Debei, M. M., El-Haddadeh, R., & Avison, D. (2008). “Defining the business model in the new world of digital business.” In Proceedings of the Americas Conference on Information Systems (AMCIS) (Vol. 2008, pp. 1-11). While this is absolutely makes sense, one could also argue that ‘blended learning’ is a better learning model for big organizations and companies to be used for reducing training costs. Dear Hagen, Thank you so much for adding these sources.